Shake it baby! Just the right size for little hands to grasp and shake, the Shake ‘n Rattle Maracas will get baby rattling and rocking to the beat in no time. 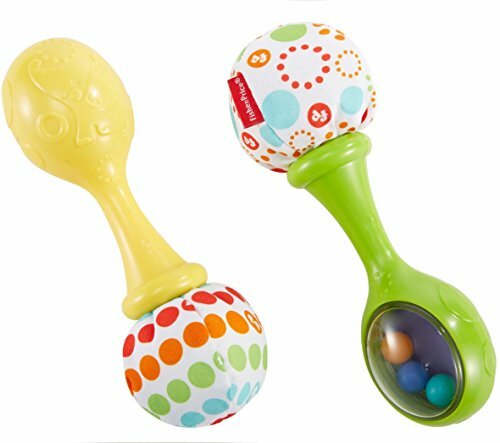 Your baby will love shaking and making music with these colourful maracas. While your little one is playing, important skills are developing. Colourful rattle beads whirl around on one side as baby shakes, and a soft pom-pom adds texture on the other end, both of which stimulate your baby’s senses. Grasping and shaking the maracas helps strengthen gross motor skills. Make some noise ? place a rattle in baby’s hand and gently shake it. As baby begins to have control over grasping ? they can hold on and let go on purpose ? your baby will probably be interested in grabbing, shaking, and dropping a rattle.